This past week was spent celebrating Unity Week! We spoke to the children about how important it is that we accept each other and celebrate the differences we all have. 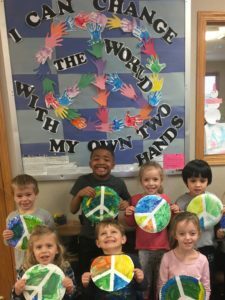 Montessori curriculum incorporates culture and diversity lessons for students of all ages to learn about diversity in the world in and outside of their classroom. 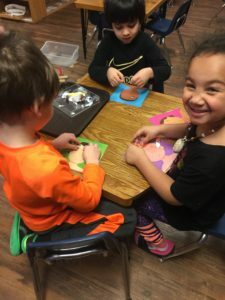 During Unity Week and Dr. Martin Luther King Jr. Day we took the time to highlight our diverse cultures even more so than the Montessori preschool curriculum does on a daily basis. 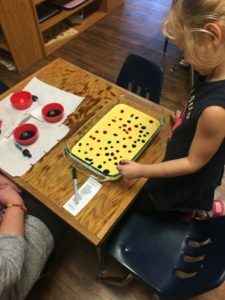 During the week we made “Peace Plates,” a “Unity Cake” where the children took turns putting different colors into the cake, the children worked with different physical attributes of people to make different faces (last picture), and we spoke briefly about The Liberty Bell as they made their very own foil liberty bells. 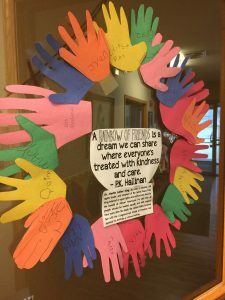 While doing activities other than Unity Week activities we witnessed the impact of Unity Week and Martin Luther King Jr. Day. 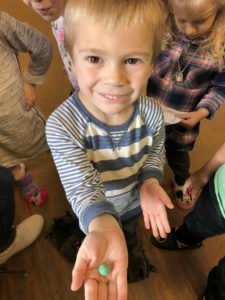 For example, our smiley Montessori kid (below) noticed that his green and blue clay ball from our Montessori clay blending work “looks like the world!” On Monday, Dr. Martin Luther King Jr.’s Birthday, the children celebrated by learning about Dr. Martin Luther King Junior, eating the unity cake they made, and talking about the importance of diversity. We explained all of the wonderful accomplishments Dr. Martin Luther King Jr. made for our country and how these accomplishments are carried on today. 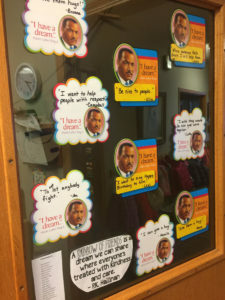 The children then had the opportunity to talk about what their own dream is (in reference to Dr. King’s dream). Some of these wonderful answers are below (picture).